The teaching experience at the Petoen Model School has been wonderful! I can't believe my teaching practicum is officially complete (November 20). In these past five weeks, I gained many different experiences from the Tibetan culture and in the school community where most teachers and students live on campus. The children not only learn and play in this community, but they treat each other like brothers and sisters. The teachers are not only educators but also play the parenting roles. The teachers' dorms are always open and they share a large part of their non-teaching time with the children. 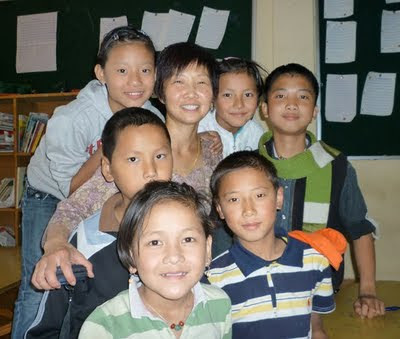 At Petoen School, students are taught only Tibetan from kindergarten to class 3. Students begin learning English in class 4, Chinese (Mandarin) in class 6 and Hindi in class 7. Starting at class 6 level, all subjects are taught in English but most subjects required Tibetan translation. The students loved singing so we did a lot of singing with them during lunch time. The curriculum is based on the Indian education system and students are expected to write board exams that start in class 10. One large difference I noticed between the students in India and the students in the Lower Mainland is that in India, students are required to memorize information rather than understand the concepts. Although the local education director encourages teachers to teach for understanding, I have noticed that many local teachers teach according to their textbooks. Many of the Canadian teachers used group work which empowers students to think and discuss ideas. This type of learning has been quite difficult for the Tibetan students. Initially, many of them struggled with the activities. This type of learning was definitely different for them but we pushed the students' boundaries and some of them began to contribute their ideas to class discussions. Tibetan children are deeply engrained in their culture and the Buddhist religion. They are taught to pray and memorize scriptures every day. They learn to sing and dance to traditional folk music. One interesting thing they learn at a young age is Buddhist debate. I watched young children as well as adult students in Sarah College (a Tibetan college for higher education) and found the process very fascinating. This type of philosophical debate is based on Buddhism but it trains the mind to think logically. The Petoen Model School consists of Montessori preschool and classes 1 through 6. It has a total of 177 students with most of them being boarders. The school year is nearing its end and students and teachers go for a two-month holiday starting from December 20. The students will be picked up by their parents and head back to their homes in other parts of Tibetan settlements spread throughout India. After six weeks working with the students, my practicum has come to an end. On the last day of school the SFU student teachers were surprised by traditional Tibetan singing and dancing performed by the students. They wore traditional Tibetan costumes and were fabulous! During these few weeks, I have learned so much about the Tibetan culture from the students and developed relationships with them. Many of them wrote thank you notes to me and began to cry after giving me their notes. I was very touched by the messages and the kind wishes they wrote me. They asked for my home address and said that they will write me in the future. It was definitely a difficult departure. Now we have officially finished our semester we will be leaving Dharamsala on Monday, November 23 and will begin our tour of northwest India. We will be begin with the Golden Temple in Amritsar, Punjab. I hope to write an update from other parts of India in the near future. 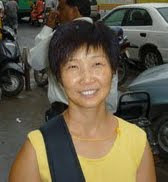 Laurie Wong, a Bachelor of Physical Education and Coaching grad, is in India with the Professional Development Program (PDP) at SFU as part of the International Teacher Education Module.